A native of Poland and talented linguist, J.E. 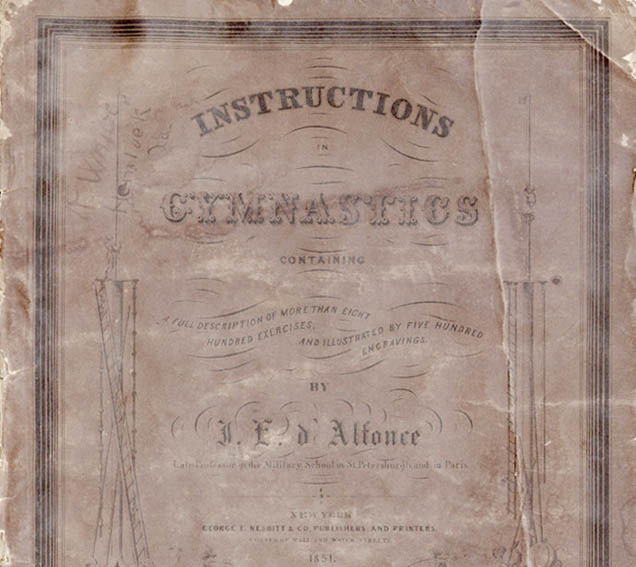 D'Alfonce was an enormously popular and skillful teacher of gymnastics at UVa prior to the Civil War. Following the war his classes were boycotted--possibly because it was discovered that he was a Union sympathizer and rode as a cavalry officer in Sheridan's command. Instructions in Gymnastics, containing a full description of more than eight hundred exercises, and illustrated by five hundred engravings. New York: George F. Nesbitt, 1851.